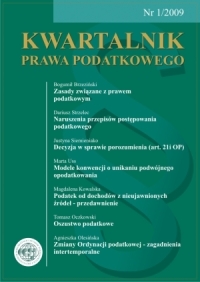 The Centre of Tax Documentation and Studies has published a periodical: „Tax Law Quarterly” („Kwartalnik Prawa Podatkowego”) since 1999. „The Tax Law Quarterly” is a scientific journal concerning national, international and European Union tax law. In the „Tax Law Quarterly” there are published mainly scientific articles regarding tax law and tax science. Besides, there are published reviews, reports on conferences and materials regarding tax law such as the Centre of Tax Documentation and Studies Reports about the state of polish tax law. Studies are prepared by famous and highly-regarded authors – both Polish and foreign – mainly from academic circles.